As a child of the ‘80s, there were few things I looked forward to more than Saturday morning cartoons. From “Looney Tunes” to “G.I. Joe” to Walt Disney Co.’s (NYSE: DIS) “DuckTales” … my sister and I would munch bowls of sugary cereal and stare at the TV until our parents kicked us outside. For my kids, however, cartoons and TV are an entirely different experience. Commercials are few and far between, and the Saturday morning cartoon ritual is now a cast-off relic, just like my prized die-cast metal Voltron toy that’s gathering dust on a shelf. We have Netflix Inc. (Nasdaq: NFLX) to thank for this transformation in our viewing habits. My girls watch episodes of “My Little Pony” and “Miraculous Ladybug whenever the whim hits. They are no longer constrained to TV time slots. In fact, they don’t even know what TV time slots are. This development is a major boon for consumers. They can now binge-watch their favorite shows on demand. However, it is the bane of mass-media companies like Disney. While Disney has fared better than most by licensing its content to Netflix, it owns ESPN, which has lost 12 million subscribers since 2011. But Disney has come up with a solution for both its online streaming content and ESPN. And it will be the death knell for cable TV. This mass exodus of viewers from traditional TV has picked up steam in the past several years, signaling the death of cable TV. 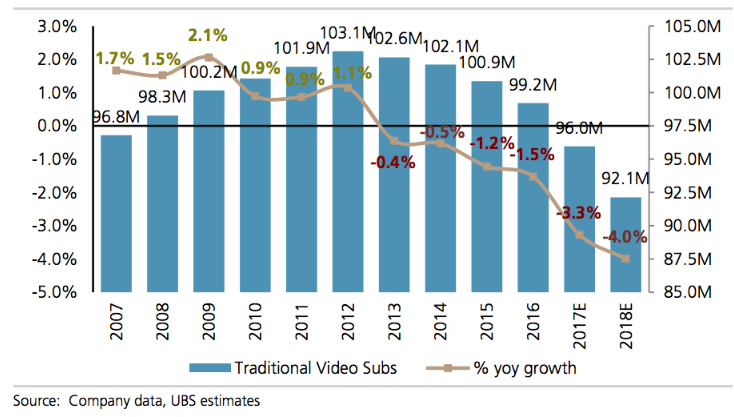 But it’s one thing for analysts to project a cratering cable TV market. It’s another thing for content providers to admit there’s a problem and adapt. After all, millennials have been moving toward streaming content for quite some time. And Disney made a move that will knock the cable TV industry off its remaining legs. The company ended its streaming agreement with Netflix and opened its own online streaming service … which includes longtime cable TV staple ESPN. The lack of streaming sports content was a rallying cry for the cable TV industry for years. Viewers may stream shows on Netflix or Hulu, they argued, but they will keep their pay TV subscriptions for access to sports content. And now, Disney placed a $1.58 billion bet on online sports content, taking a majority ownership stake in BAMTech. If you watch baseball, you may have heard of BAMTech. It’s the company that handles Major League Baseball’s online streaming service. Disney launched its ESPN-branded, multisport video streaming service earlier this year using BAMTech’s existing technology. The move is clearly the right decision for Disney if it can make the service work. But one thing is clear: Cable TV is dead, and Disney is moving on.